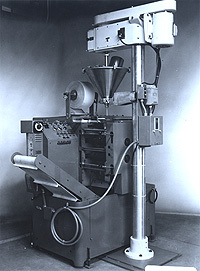 Vertical form fill seal machine for packaging: liquids like gels, sauces, lotions, creams, shampoos. Powders and granular products. Also tablets and capsules, vitamins and nutraceuticals - also small part loadings. Footprint - Approximately 4 ft. x 8 ft. 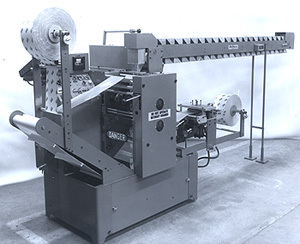 Attachments are available for counting, strip packaging,hole punching, easy opening tear slits, and other special functions. Attachments are available for producing front and back registered printed pouches. Optional horizontal input conveyors can be used to collate products and deliver items to the vertical feeding area where liquids can also be dispensed into the package. Adjustable package size in both width and length. Multiple lane operation for high speed packaging.